Finally, you and your friends can find that perfect date, time, and place to gather! 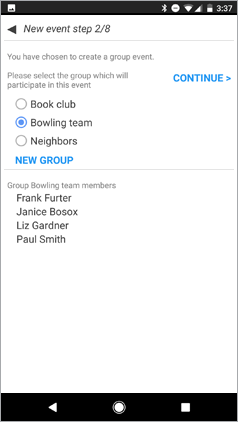 Group & Gather is a free app for iOS, Android, and Windows – but your friends don’t even need the app to participate! 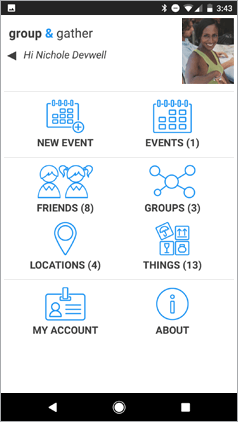 With just a few quick taps you can set up an event, allow friends to share their availability, find a location, and even coordinate what to bring. 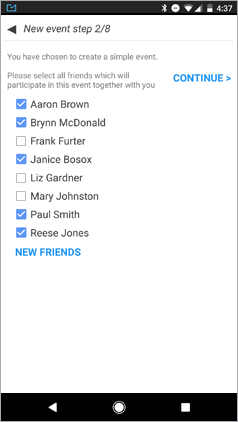 You can choose friends individually to invite to your event, or select a group of friends that you’ve already defined. To add a new friend to your Group & Gather friends list, just enter his or her email address, or select it from your device contacts. 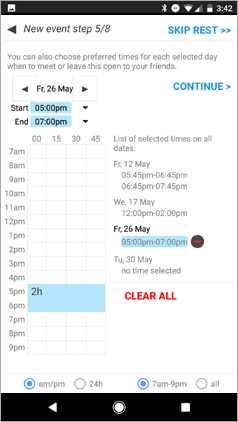 As the event organizer, you can select a date and time for your event – or provide a list of available options that guests can vote on. It’s easy to either set the location for our event, propose a choice of locations to your group, or leave it open for guests’ input. 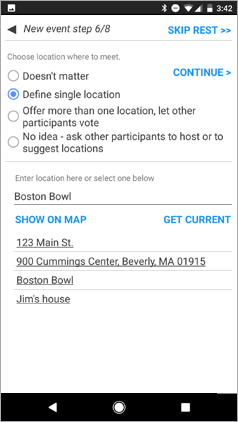 To propose one or more locations, either enter the address manually, let the app detect your current location, or use a location from a previous Group & Gather event. 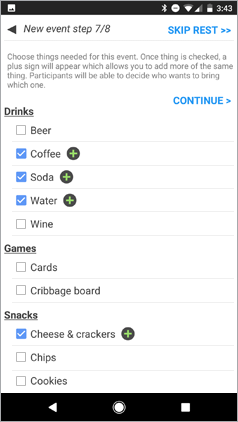 You’ll also want to let people know what items are needed for the event and let them select what they’d like to bring, streamlining communication and eliminating the problem of duplicates. Invite Friends – Whether They Have the App or Not! 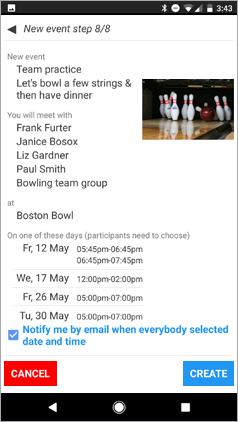 Best of all, for those who don’t have the app, Group & Gather can generate emails with special links that allow your friends to respond to all questions from any web browser and their answers are automatically connected to the app. 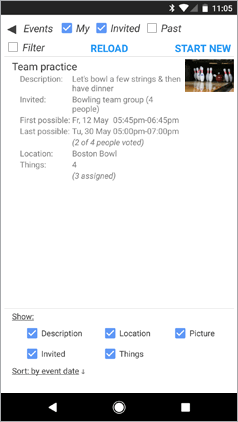 This means your group can use the app - or the emails - and still fully participate in the process. Every option can be set by you as the organizer or put out to a vote. 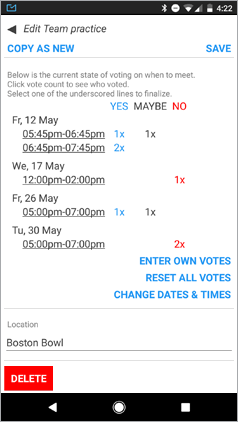 Once guests vote, you can see which options work best for the group. You’ll see everyone’s selections in Group & Gather, and the app will even tell you which options got the most votes. Group & Gather solves the problem of trying to figure out your friend’s schedules from an endless stream of emails and texts. Other apps solve some of the problems, but Group & Gather solves all these problems in the same app. The Group & Gather app for Android, iOS, Windows Phone, and Windows 8/10 was built with Altova MobileTogether, a sophisticated and cost effective framework for developing apps for all platforms. A single app design developed in MobileTogether allows you to generate native apps for all platforms – in record time. Though developing apps in MobileTogether is easy, the framework is powerful enough to build any data-centric app imaginable – with no restrictions on complexity of the final product. Build the mobile app you’ve been dreaming about with MobileTogether! Copyright 2018 Altova. All Rights Reserved. Patents Pending.